Weeks after Paul Walker‘s passing, it’s still unclear how exactly Universal’s Fast & Furious 7 plans to work around his absence. But one option you don’t have to worry about is that Justin Bieber will be taking over the part. Ricky Gervais will put in another Night at the Museum. The Brit actor will reprise his role from the two previous films as Dr. McPhee, boss of Larry (Ben Stiller). 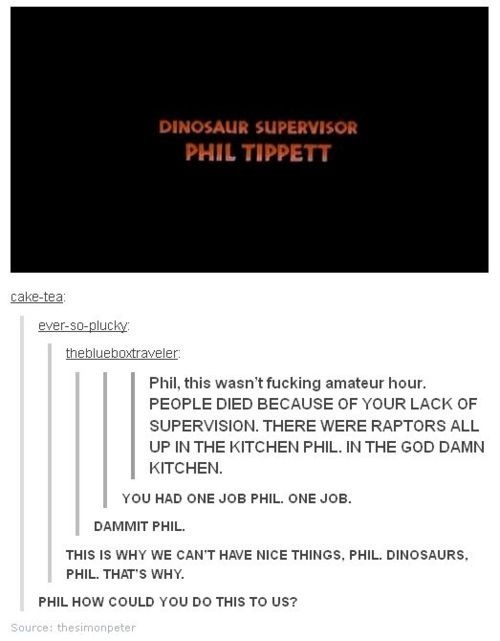 The Internet loves to yell at Phil Tippett for failing to do his “one job,” but in truth, he was so good at his actual job that he’s being asked to do it again. Director Colin Trevorrow has confirmed via Twitter that the “dinosaur supervisor” will be back for Jurassic World, which picks up 22 years after the first film. When Lou (Rob Corddry) finds himself in trouble, Nick (Craig Robinson) and Jacob (Clark Duke) fire up the hot tub time machine in an attempt to get back to the past. But they inadvertently land in the future. Now they have to alter the future in order to save the past… which is really the present. Don’t hold your breath for a Kill Bill 3. Although Quentin Tarantino has talked up the possibility in the past, he admitted last year that the film would “probably not” happen, and he now seems thoroughly uninterested in revisiting the tale. Twelve years on, Ben Stiller still hopes to make Zoolander 2. But it probably won’t be anytime soon. Part of what’ll make Zoolander 2 “of its time” will be the new plotline. Stiller says the famously dim fashion model will have a “new look” to replace Blue Steel — which is a good thing since he’s trying to catch up with the rest of the world. I think part of the sequel will be about how the fashion world moves so quickly. So, the movie will begin at a time when the whole world has moved on from Derek and Hansel because they’re so ancient history. It’s about them having to reinvent themselves and try to become relevant again. Although Michael Bay has declared that he had a “fantastic time” shooting Transformers: Age of Extinction in China, not every day was smooth sailing. You may recall that in October, the crew were the victims of two separate extortion attempts, one of which involved an air-conditioner attack. Not to be outdone by Queen Gorgo and Calisto, Artemisia and Themistocles have unveiled their own 300: Rise of an Empire character posters as well. Artemisia (Eva Green) looks ready to go head-to-head with Katniss Everdeen and Bard the Bowman in an archery contest, while Themistocles (Sullivan Stapleton) tries to catch flies with his mouth.